Apple iOS 11 released provides options for some great features like easy access to files, a new dock that provides iPad users with a new way to work, multitasking, drag and drop and lots more. The event of Apple’s Worldwide Developer’s Conference which lasted for about more than two hours, was full of news about what Apple’s doing with macOS, its hardware, and especially iOS 11. But there’s only so much you can cram into two hours when you have to focus on big features like augmented reality or launching a smart speaker. That’s why one of the best parts of the show is the moment when Apple just says “screw it” and they skipped a lot more dozen new features into one slide. But here I have complied all the exclusive apple iOS 11 features for you. Digital assistants are just as frustrating as they are helpful, so making it easier to interact with them is always welcome. It looks like Apple is finally going to add one of the most requested features for any digital assistant — you’ll be able to type to Siri in Apple iOS 11. Socially awkward tech nerds, rejoice! QR codes aren’t nearly as big in America as they are in other parts of the world, and so Apple has been able to skate by without naively supporting QR codes for a while now. But it looks like the company’s finally changing that by adding QR code support to, likely, the native camera app in iOS 11. Finally — no more bothering with third-party apps once a year when you need to scan a QR code. APPLE PLAY : this will simply allow you send money to friends just by typing it in a message. Apple started allowing developers to offer third-party keyboards with iOS 8. Since then, it’s been picking some of the most-loved features available in that marketplace (like stickers and apps) and slowly adding them to iMessage. The newest one coming to iOS 11 is one-handed mode. We obviously haven’t seen exactly how it will work, but expect the feature to squish the keyboard layout to your preferred side, maybe even in an arc. There’s also a mention of “one-handed zoom in Maps,” which will hopefully make Apple’s mapping app a bit easier to use. Following in the footsteps of competitors like Samsung, which started allowing screen recording (and GIF creation) on its last few Galaxy phones, Apple appears ready to add that functionality in Apple iOS 11. Here’s hoping Apple will let you capture and create GIFs, too. This feature got a bit more of a tease during the iPad Pro demo, but it looks like Apple is making it much easier to mark up the things you screenshot on your iOS 11 devices. Instead of dipping back into the camera roll after you take a screenshot, you’ll be able to quickly re-crop and markup the image right away. NEW LOOK ON APP STORE : the app store has been given a new look to help you find what you are looking for easily. Apple says “ it is the biggest thing to come to the Apple store ever. Apple is redesigning its entire App Store in Apple iOS 11, so it’s not surprising that it’s going to overhaul the Podcasts app, which is a whole marketplace of its own. Discovery has always been tough on Apple’s own podcast listening app, so this is the company’s chance to get it right. I don’t know about you, but every (rare) time I use Safari on my iPhone I always forget how to access tab switching. Then, after I find it, I wind up stumbling around the interface, trying apply Chrome’s tab behaviors to a different browser. Is iOS 11 going to fix that? Hard to say. But making it easier to swap between tabs — and giving 3D Touch some purpose — is a welcome change. Speaking of 3D Touch, it appears that Apple is expanding its usage in iOS 11 in other ways, too. It will apparently serve as a shortcut to the “look up” feature, which lets users get a quick set of definitions or related web search results for a highlighted word or phrase. 3D Touch is also getting more integration in iMessage, with apple adding an ability to share URLs with the feature. CAMERA: Various new filters have been added that will enhance the camera on iPhone. With a new compression technology that allows you take quality pictures like the ones before but at half the file size. Something Siri’s been behind on when compared to Google’s Assistant is knowing when and where you’re going. That will change with Apple iOS 11, which will now grab your flight information and keep it visible (and make it searchable) in a Spotlight widget. In Apple iOS 10 the ability to send iMessages to other iPhone users with special effects was debuted, and there are two new ones in iOS 11: Echo and Spotlight. To make use them, by typing in your message, hold down the send key (), and tap Screen up top. Echo, which shows multiple echoes of your message, this will then will be your first option. Swipe left to see Spotlight, which puts a simple spotlight on your message. Continue swiping left for other options. This scenario requires two persons, running iOS 11 and of course Live Photos has to be turned on. To capture a 3-second Live Photo during a Face Time convo, to start live photos, click the white shutter button on the bottom (left if you’re in portrait, right if you’re in landscape). You can’t do this stealthily—the person on the other end of the call will get notification when the Live Photo is captured. If you desired a much longer video, use Screen Recording, but you can’t record audio with it on a FaceTime call. Either party can turn off the option in Settings > FaceTime > FaceTime Live Photos. 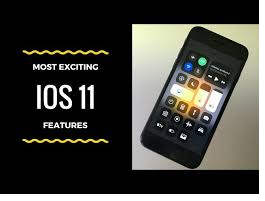 With these efforts and astonishing features which has being included in the apple iOS 11, apple everyone’s dream around to it’self. beside they are set to out smart every other device in the market in the near future if not now. It might not surprise anyone if there high demand rush of these newly update devices hence they really a device to experience. As for now let keep our eyes and ear open to see what the future holds for android, and until let explore these futures from the giant in technology apple. ← Apple iPhone X FACE ID Update.